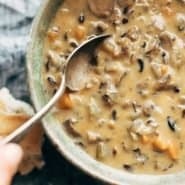 This Crockpot Chicken Wild Rice Soup is so darn simple to make and goes perfectly with a piece of crusty bread on a cold winter night. It’s not really a secret because a) I’m from Minnesota, the homeland of things like creamy delicious Wild Rice Soup, b) I’ve only posted it at least seventeen other times on the blog, and c) WILD RICE. So this time the thing that makes it special is the Crockpot. This is Chicken Wild Rice Soup meets Chicken Bacon Wild Rice Soup mashing up into Crockpot Chicken Wild Rice Soup. Translation: life just got easy and I’m going to go watch Breaking Bad now while my dinner cooks in a large kitchen appliance without my supervision thank you very much. By the way, I don’t watch Breaking Bad yet but I’m 99% sure that I’m going to start today. Yay or nay? This is a perfect meal for the current state of our new kitchen. I want to tell you about our new kitchen in our new house, which I feel like I should mention is a foreclosure. So give her some extra compassion, okay? It’s, um, how do I say this? Small. Small = less stuff = maybe even a little bit freeing. Small = less distance to walk to get to things and fewer places to clean. Just saying. It has a real live window and I have my photography table set up in the kitchen. Never before, guys. THIS IS AMAZING. It has a jumbo, awkward, 1980’s fridge and I bump into it at least eighty times a day. The stove is gas. It says the word CALORIC on the panel. So thanks for that. It has a window. Actually, two. Did I already say that? Hiphiphooray! It has a big sink that holds lots of dirty dishes and keeps them out of sight. It has a non-functional garbage disposal. Oh well? Back on topic. I was saying that this is perfect for the current state of our small kitchen because we don’t have everything all in order just yet. For example, I burned the Thanksgiving corn pudding because my oven was playing tricks on me, and no, it had nothing to do with Bjork hearing 475 instead of 425. And for another example, I keep forgetting boxes of kitchen stuff at our other house so I made frosting yesterday with a whisk attached to a drill. A DRILL. oh my gosh, I mean, really. What are we coming to? But when everything else is chaotic, my steady and true Crockpot friend gives some stability and cooks us the most cozy, comforting dinner while I’m at work and making yet another run to the old house for the box with the hand mixer in it. Crusty bread, this piping hot soup in a large bowl, and extra time on your hands. TIS THE SEASON FOR THAT. Rinse the wild rice. Place the uncooked wild rice, raw chicken, mirepoix, chicken broth, and poultry seasoning in a crockpot. Cover and cook on low for 7-8 hours. The chicken should be cooked through and the rice should be soft. There will be extra liquid in the crockpot; do not drain. Remove the chicken breasts from the crockpot and allow to cool slightly. Using two forks, shred the chicken. Return the shredded chicken to the crockpot. When rice and chicken are done cooking, melt the butter in a saucepan. Add the flour and let the mixture bubble for 1 minute. Slowly whisk in the whole milk until a thick, creamy mixture forms. Stir in the wine. The poultry seasoning is a mix of several things, including thyme and sage. Even though it’s only a teaspoon, do not omit this because it adds a lot of the flavor. If you don’t have any, just use any other herb seasonings that you like. Thyme and sage are the best in my opinion. How many people does this recipe serve? Can this recipe be doubled? Do you cook this and then freeze it? You are going to love Breaking Bad, it’s the best. Super intense but so so soooo good. Wow. Good to know. 🙂 Thanks Mike. This soup looks delicious! How well does it reheat? I’ve always wanted to make a creamy chicken and rice soup but I know we’ll have leftovers and I’m not sure how it tastes the next day. Reheats great! Just add some water or milk. It thickens up overnight. YUM! Already pinned this…’tis the season for soup! We’re moving too, and my new kitchen is a tad smaller. I’m scared. I used to have a huge island with cabinets…not anymore. What am I going to do?? Remodeling your kitchen sounds like fun! This soup sounds like the perfect comfort food for this cold weather! Can’t wait to give it a try! Your house looks in good shape for a foreclosure. Have you come across Deb Perelman’s blog? It’s Smitten Kitchen and she has 42 sq feet of kitchen, having moved from a whopping 80 sq feet! Small is beautiful in my book ~ especially if it curs the cleaning and the temptation to hoard *stuff*. I love the soup. I’m a slow cooker (or crockpot) junkie and I haven’t made a creamy chicken soup in too long! We’re threatened with a cold snap later this week so I’ll put chicken on the shopping list! Thanks. What a delicious and easy soup for these busy months! Thanks for sharing! I live in MN too, and this soup seems PERFECT for the weather we’re going to have this week. This looks so creamy and fabulous! Any chance you could cook on high to save time? I’m making this for a friend who just had a baby and got a late start this morning…. I’m making this right now- i’m going for 5 hours on high! 1. I will exclusively be eating this soup for the next three weeks. Thanks for that. 2. Breaking Bad – I watched half of the first episode with Eric and decided it was too intense for me. But I also held my breath through most of Lost. So, I’m mostly what you would call a pansy. Hahaha. You and I might be alike in more ways than one. Firstly – Breaking Bad? Do it. It’s not even a question to be asked. Secondly – This soup? Ya, I want it. And it’s not just like “oh ya, another girl wanting soup in the winter, big whoop.” I live in Florida. Where it is 30 degrees. And, I want this soup. 30 degrees in Florida? Bless your heart, that is cold! I didn’t know Florida got that cold. I’m in So. Cal. and really looking forward to this soup, too!! This soup looks fantastic! I moved a couple months ago and my slow cooker was my best friend until we got unpacked. Wow, I’m so jealous of the window in your kitchen! Amazing! And this soup – it looks so delicious. Pinning this to my, “I need to buy a crock pot board” – b/c I need to buy one and make this soup ASAP! Yum this recipe looks amazing! Not to be totally ignorant, but what is mirepoix and how do you make it? Thanks!! Good question! Just chopped carrots, celery, and onions. It’s the base of a lot of soups and recently I’ve been crazy busy so I’ve been buying it prechopped from Trader Joe’s. Otherwise just cut up some carrots, onions, and celery and you’re good. But how many cups of each vegatables do we put? I learned to make mirepoix from a Gordon Ramsay “How To” video on YouTube. For 2 cups, I do 1 cup of chopped onions and 1/2 cup each chopped carrots and celery. I’ve made this soup and it’s WONDERFUL! It’s 99º outside in Maryland today and I have this soup on in the crockpot for when I get home from work. It’s THAT good. I am wishing I had this for dinner tonight. Tomorrow will have to do! I really wanna try this but my roommate is severely lactose intolerant, do you think coconut milk would sub well or do you have another suggestion? I’ve left the roux part out altogether once, by accident of course, but it was a happy accident. It is still delicious that way and I make it this way sometimes for a less calorie soup option. Did you ever try it with a milk alternative? My son is off dairy right now, but this soup sounds awesome! I made it with Almond milk. It worked just fine. This looks so creamy and yummy – pinned on my soup board! I hear Breaking Bad is incredible – soon as I get time, I have a date with Netflix! We have made so many of your recipes (loved them all! ), we bought your creamy cauliflower sauce cookbook (love it too! ), and I read all of your posts word for word. This is the first time I have ever posted a comment on your blog, or anyone’s for that matter, and it has nothing to do with food. You need to be warned…Breaking Bad is the most addicting series I have ever watched. You may need to set aside plans of remodeling your kitchen or even just unpacking the rest of your stuff once you start watching. We recently bought my 81 year old mother an Apple TV and she watched all 5 seasons in a month! P.s. Enjoy your new house…ours is not very big either and we have enjoyed remodeling it and making it our own and keeping it clutter free! This looks so creamy and amazing, I’m going to have to step away from my computer because I’m getting really hungry! This soup looks delicious. I love a good slow cooker recipe and this is so warm and comforting for winter! 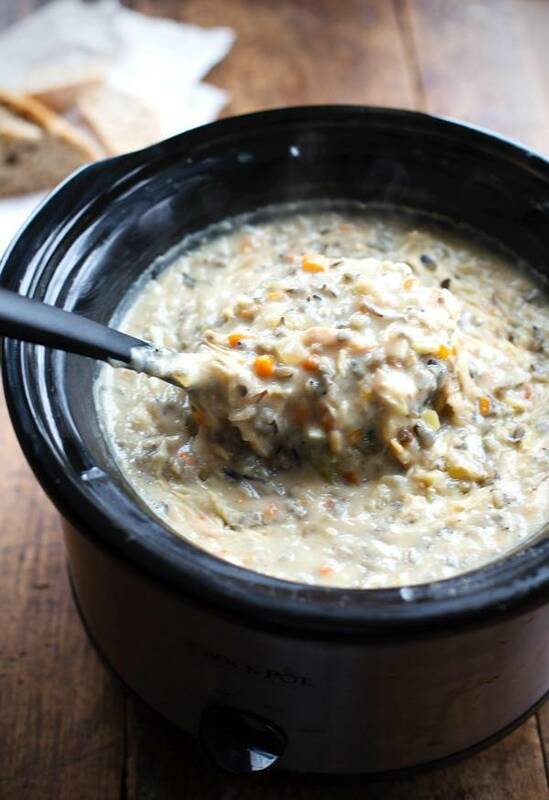 This Crockpot Chicken Wild Rice Soup looks more than just a ‘pinch of yum’! I’ve never come across this and I’m thinking of ‘Indianising’ this and making a Chicken Khichuri, the Rice and Lentil dish that we normally make. Although in many parts of India, minced meat is put in Khichuri, this is probably very different – thick and creamy. Congrats on the house! I want a small, cozy kitchen to call my own! And I say yay for Breaking Bad…one of the few shows that ended when it was SUPPOSED to and not two years after…:) Happy watching!